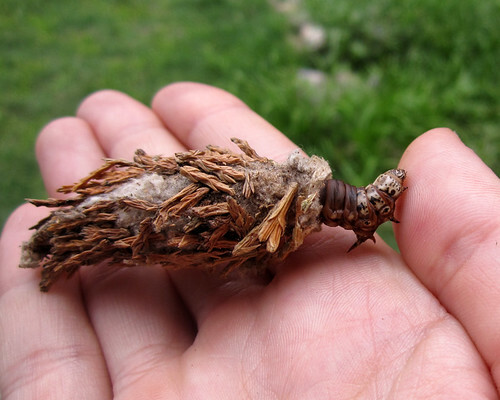 Bagworm… what an unfortunate common name. Then again, the bagworm caterpillar is not what most people would consider beautiful. But hey, decide for yourself! Bagworms are caterpillars in the family Psychidae. They create elaborate cases to protect themselves, while leaving their walking legs free to travel and feed effectively. 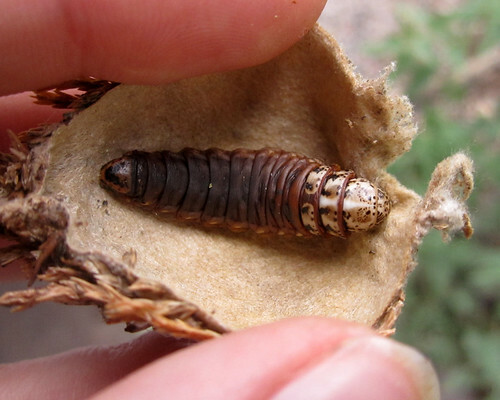 Case construction varies depending on available materials and their host plant, and the pieces are held together with silk produced by the caterpillar. They can retract into the case when threatened… this particular caterpillar was not very shy, though. Since we were sacrificing some caterpillars for our research in Arizona, I decided to open up a bagworm case to see how the rest of caterpillar looked. How strange! What wonderful construction of the interior of the case, and what a silly looking body. I have seen some smaller bagworm species in the North East (usually not more than a cm long), but they grow them big in the South West.